Friday 27th October was the last day of my half-term holiday and would prove to be a memorable day's birding on the island. I decided to head up to Pleinmont as my main target was to try and see any Hawfinches passing through. There had been an unprecedented passage of Hawfinches through the island in the last week or so but, due to work and other commitments, I had not had a sniff. The number of Hawfinches seen this month was about three times the total ever seen on Guernsey and was associated with a big influx into the UK from the continent. I arrived on the headland pretty early to see a huge Marsh Harrier feeding on a dead rabbit on the road in front of the car. I was able to watch it pretty close until if flew. I parked up by the scramble track and had a cuppa from the flask. I could see that there was plenty of birds around as I waited, with lots of Chaffinches, Redwings and Song Thrushes flying below the cloudy skies. I headed off towards the Societe fields and started noting the odd small Skylark flock moving over. Looking further ahead, a flock of Starlings dropped down onto the lawn of Mabel's Cottage and I was sure I saw something pale flash down with them. I could not see the lawn due to the hedge but as I approached the flock flew back up onto the cottage roof and there, as the birds posed for a line-up, I could see there was a juvenile Rose-coloured Starling with them. That wasn't bad, the first rarity after just a few minutes of looking and the second Rosy Starling I've found this year! It was very elusive though and only was seen a couple more times during the next 20 minutes and then never again - an unusually short-staying bird. Buoyed by this great start, I carried on scouring the top fields and hedges - it felt very "rare" today. There were so many Song Thrushes bursting out of every piece of Blackthorn scrub that I came to, along with lots of Redwing and Blackbirds with a single Fieldfare going over. I was particularly noting the smaller birds that were passing in case one was a Hawfinch, but each one I focussed on was a Chaffinch. In amongst these however, unsurprisingly, called the odd Brambling. I couldn't find anything else rare on the outer headland but there was a notable influx of Stonechats and my first Black Redstart of the winter on the cliff edge. During this walk round, I received a grapevine alert about a flock of 10 probable Glossy Ibises flying east over Fort Doyle early morning! Blimey! That would only be the second island record and no one has them on their list. However, since Fort Doyle is literally the furthest point away from where I was standing, and the birds were flying the wrong direction, I thought it was sensible to just continue on my way and hope for more news. As stuff was still moving overhead I continued on to check the fields of Mont Herault. More of the same, including more flocks of Skylark, at least a hundred birds altogether, but most were not staying. As the morning progressed, huge flocks of Woodpigeon kept appearing from the north - there must have been thousands moving that morning. A Golden Plover called and circled the fields but I was disappointed not to find anything scarce. Apart from Stonechats and a single Wheatear, there was not much on the deck to search through, and identifying rarities from specks flying high above isn't the easiest. As I headed back west towards the car I was sure I saw a Hawfinch pass low over the trees by the roadside, but I'd picked it up after it had passed me and could not, hand on heart, say it definitely was one. 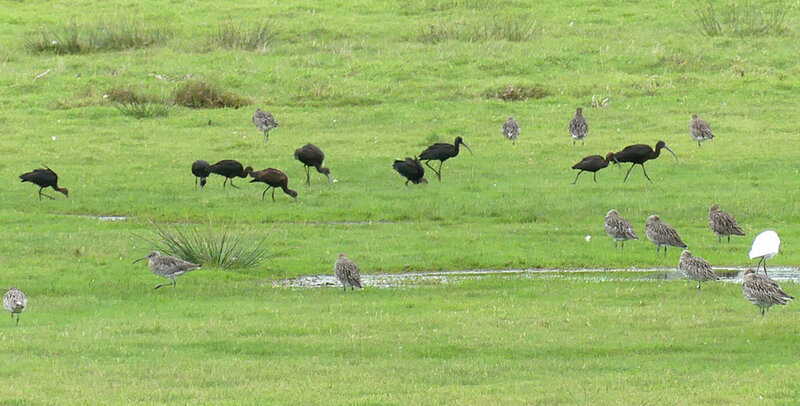 As I crossed the scramble track, I received a phone call from Mark G that the Glossy Ibis flock had just been spotted on the Old Aerodrome at L'Eree! Luckily, I had returned close enough to the car for it to be visible and was able to pile in and screech away within minutes. I broke the land speed record along Rocquaine coast road and pulled up at the triangle to tick off GLOSSY IBIS for my island lift. Superb! It was especially pleasant to have a nice straightforward twitch - no searching for the bird, as they were bloney obvious, and they were always on show. Lots of people arrived and it was nice to see everyone enjoying the birds, a species we had been awaiting for quite a while now. Despite the regularity that they have been turning up in the UK, Guernsey has been surprisingly empty of ibises. There was a single-observer record a few autumns ago but that's been it - so it was a tick for everyone (well, everyone who wasn't having to be at work!). Also on the Aerodrome was a Ruff and a few Lapwing. After a while, I decided to continue up at Pleinmont since I had not covered any of the valleys yet. When I arrived up there I received a message that the ibises had flown off soon after I had left. So, if it wasn't my half-term week, I would have probably missed them as they didn't stay into my usual lunch hour. [As it happens, there would be plenty of chances to catch up with them over the next few weeks, but at least I avoided the stress of trying to find them]. There was still plenty of birds on the headland, but not much more was passing over now it was almost midday. The most unusual sighting was a bird circling really high up with a couple of gulls which, due to long pointed wings I thought could be a tern, but putting the bins on it was a Black-tailed Godwit. God knows what it was doing so high over the headland. 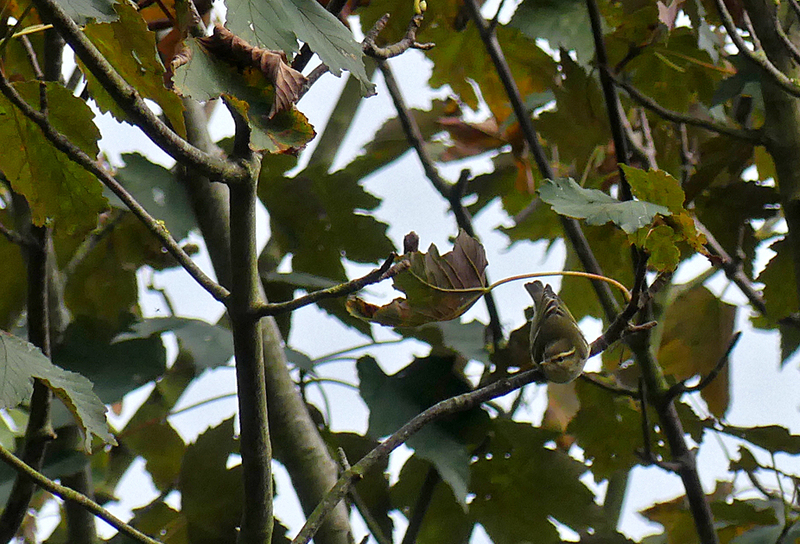 I checked out Pezeries and Vau de Monel where there were still plenty of Firecrests after the influx last week. I found a Yellow-browed Warbler down by the hairpin and a very pale Chiffchaff in the same flock which eluded me. I also had a couple of Siskin and at least two Water Rails calling from the scrub, but not the Hawfinch that I'd hoped for. But an island tick and a decent find was more than satisfactory for a morning's birding. I spent the rest of the day at home and due to the good migration that had been happening that morning, I kept popping out into the garden for some short vis-migging sessions from my new viewing spot atop the rockery. There were still lots of birds flying around, plenty of Redwing and finches of various species. I had two Swallows heading south late afternoon, and then, at about 4:40, directly above me and quite low, almost skimming the rooftops, heading directly west, a fabulous HAWFINCH flew by. Even though I didn't even have time to pick up my bins, the identification was straightforward, being a chunky bird and flashing its moon-shaped wing patches at me. The bird also called - but not the usual 'tic' flight call, but a different, soft high-pitched call. This has apparently been the most common flight call heard through the UK during the influx. Although I was half-looking for a Hawfinch, it was still a big shock to actually spot one - especially since I'd spent all morning failing to find one. So two Guernsey ticks in one day! I can't remember the last time that happened, and I don't know whether it will happen again. Going back to previous sightings, the day after our trip to Herm, was a good day at Pleinmont apparently, with 2 RBFlys and a big influx of about 50 Firecrest. Although I was busy that day, this did encourage me to give it some welly on my patch during the next week. There were indeed plenty of Firecrests, with at least 5 at Le Guet and 4 at Rousse, plus a couple of singles elsewhere between 16th and 19th October. At Le Guet on 19th there was a lone House Martin and, what gave me rather a shock, a late Whitethroat feeding high in the Sycamores! Seeing common birds in unusual places can initially cause brain freeze and you temporarily wonder what the hell you're looking at. Then finally in the same place, in my lunch hour on 20th I saw only my third patch Yellow-browed Warbler. Super-stormy conditions on 22nd, with the wild wind blowing from the north, meant another trip to the rocks of Jaonneuse for seabirds. As it was high tide and the waves were big, the brave band of seawatchers regularly were covered in spray from the sea, and occasionally with the actual waves! It was indeed tricky conditions for viewing but we saw at least 50 Bonxies passing plus a couple of Arctic Skuas and some Kittiwakes. We thought we stood a chance for Leach's or Sabine's but it was not to be (again) - although one could have passed and we may have missed it behind the foamy crests. The mighty seawatcher clings to the rocks (photo by Wayne). As you can see, I am rather wet! The other notable natural event happened on 16th when at work. I looked out of the window to see that the skies were strangely dark despite it being mid-morning and the sun was a deep red colour. Apparently this was due to the southerly airflow from storm Ophelia - which was the remnants of the easternmost Atlantic hurricane ever recorded - which was bringing a combination of Saharan dust and smoke from Portuguese forest fires into the atmosphere. I'm glad there was a scientific explanation for this blood red sun as I was wondering whether it was the start of the apocalypse!